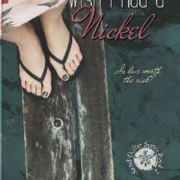 Wish I Had a Nickel is the second book in The Sand Dollar Series by J D Boudreaux. A heartwarming story for sure. 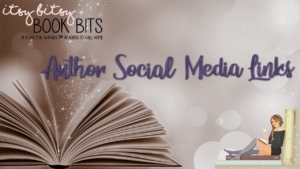 A story that you can get lost in with great characters that you will come to love. Ms. Boudreaux has captured my interest and heart with this series. Alex & Leigh have always been inseparable. Growing up it was natural to see one with the other. But when Leigh’s family moves out of state, the distance and separation cause them to drift apart. Fast forward 30 years and Alex & Leigh meet again. After years of separation will they be able to use their old friendship to build a new romance? Ms. Boudreaux does a wonderful job of bringing the reader into the story from page 1. 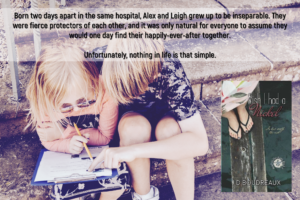 Watching Alex & Leigh’s friendship grow, the reader can’t help but be enamored of what they have together. Ms. Boudreaux pulls lots of emotions from the reader and keeps the story at a great pace. 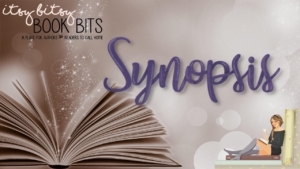 Memorable sub-characters help to move the story and Alex & Leigh’s romance along. 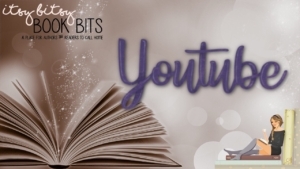 Along with the Alex & Leigh, the reader is reunited with Penny from Ms. Boudreaux’s first book in this series which is fantastic because the reader is able to understand more about the characters and their interactions with each other. I was happy to read there will be a 3rd book in this series so I can go back and visit with the wonderful characters. My only caveat to this review is read book 1 first. I know most often; authors will release books in series that can be read as “standalone”. This is not really the case here. 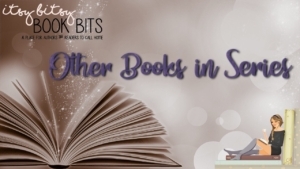 To get the most out of this book the reader needs to read both books. 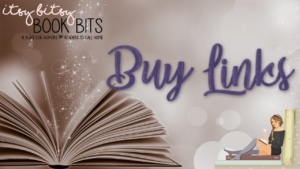 You will love all the characters and fall in love with the story and author! 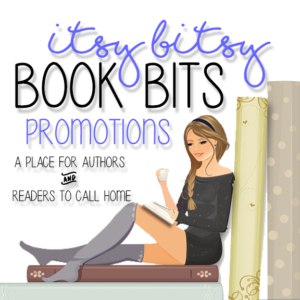 I highly recommend this book and author as someone that needs to be on your TBR list! A great read about change. Alex and Leigh have been best friends since forever. They fall in love as teenagers in a sweet romance. But life separates them as her family moved away. Can their love survive the distance? A great read. Well developed plot. Well developed characters like Alex sweet and unsure or Leigh more confident standing up for herself. A sweet tale about how even friendships can sometimes end despite our best efforts and that it is hard to mend. I loved the visual detail throughout the novel in the sense of a small town with its little shops and small streets and everyone knowing eachother. Also loved how it got straight into the action grabbed the readers attention.A great way to show how Alex came to be the man he is today. I just felt a bit confused after reading the first novel as it felt like it didnt fit with the first story and didn’t feel like a prequel either. If this was clarified, it would be more enjoyable. Overall, a great read and I would give it four stars. 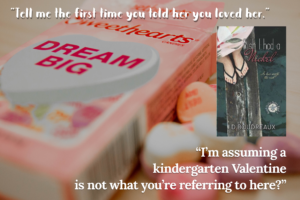 Wish I Had a Nickel: A Sweet Romance by J.D. 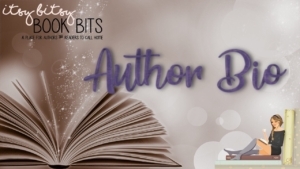 Boudreaux is the second book in The Sand Dollar series. What happens when you are separated by distance after being born 2 days apart. Alex and Leigh are the closest of friends until one moves away. After thirty years the two are reunited. Will they find their happily ever after. Like the first book in the series (which I recommend reading first) these are sweet people that you are rooting for in the story. I liked this book even though I felt that it got a bit sappy at times. This isn’t a bad thing and a nice relief from the heavy drama, petty, and conniving characters that are so often seen in books. 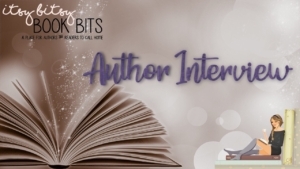 The characters are well written and there is so much attention to the details of the characters and the story. The writing gives a nice, easy flow to the story that has me losing track of time and not wanting to put the story down. I look forward to more of this in the future. 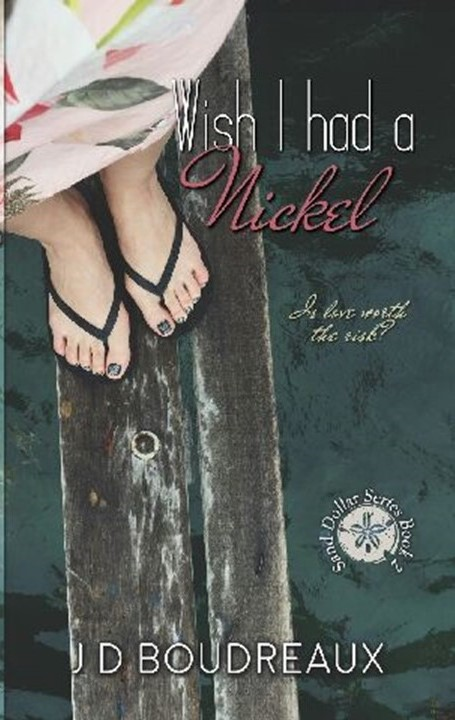 Wish I Had a Nickel is the second book in the Sand Dollar Series. 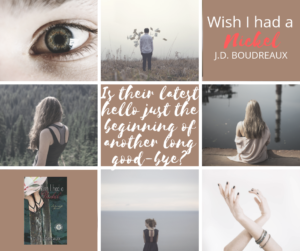 J. D. Bourdreaux is a mastermind at writing characters that are complex but, in the same fashion able to relate to them. Being that this is book 2, I recommend reading book 1 so that you will get more enjoyment out of this book. 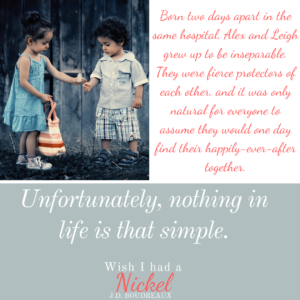 Ms. Bourdreaux has continued the story of Alex and Leigh. I felt a relax flow through this story as if Ms. Bourdreaux really had fun writing this book. This story has more than just romance in the story. There was more friendship, love, family, and fate in this story. I hope you enjoy this book as much as I have. I am looking forward to the third book which is being released soon. Wish I had a Nickel by J.D. 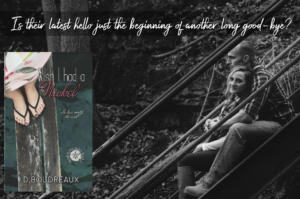 Boudreaux a four-star read that you can wish upon. This is the second novel in the Sand Dollar series I have enjoyed the first book in the series Penny for your thoughts and then this one and I can’t wait for the third. 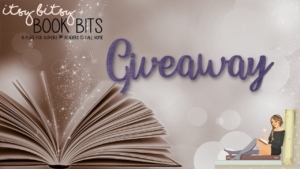 This one is about second chances romance and sadness, love and drama, the author has great descriptive ways you will feel like you are there with them know what’s on each corner of the town, the author has built the story over the two books and the third will be better I’m sure as they build on each other. Alex is a compelling story teller and he will make you listen. This story touched a place in my heart I try to keep locked away. No one wants to lose the person they love. But when you have no choice in the matter it makes it so much more heartbreaking. Alex is at a point in his life that he wants more but isn’t sure why he hasn’t taken the steps to get it. I honestly would love to meet a guy like Alex. He is a great character. Don’t get me wrong he is definitely flawed but he doesn’t pretend or put up airs about himself. I like that this is Alex’s story. We read so many books in the females PIC that when it’s a males it catches your attention. The author did a wonderful job with this book. The story was superfluous or exaggerated. When you read this book it almost read like a memory being told to someone. A sharing of a love never forgotten.